The first step in hydrogen storage is chemisorption, wherein gaseous H2 collides with palladium and adsorbs (sticks) to the surface. Secondly, the chemisorbed H atoms diffuse into the sub-surface, several nanometers deep. A recent article published in Proceedings of the National Academy of Sciences (PNAS) reports that the group focused on this slow second step, which is the bottleneck to the overall process. In pure palladium, only around 1 in 1,000 of the H2 molecules that collide with the metal actually absorb into the interior. Hence, only these can be stored as energy carriers. However, when the palladium surface is alloyed with gold, absorption is over 40 times faster. It is vital to get the amount of gold just right—hydrogen absorption is maximized when the number of gold atoms is slightly less than half (0.4) of a single monolayer of palladium, according to the study. This was discovered by thermal desorption spectroscopy, and by depth-measurement of the H atoms using gamma-ray emissions. "We wanted to know what role gold plays," study first author Kazuhiro Namba says. "The gold atoms are mostly at the alloy surface. However, our results showed that hydrogen storage is improved even below this depth, in pure palladium. Therefore, gold must be accelerating the diffusion of hydrogen into the sub-surface, rather than improving its solubility." This diffusion acts like a typical chemical reaction—its rate is determined by the energy barrier, i.e. 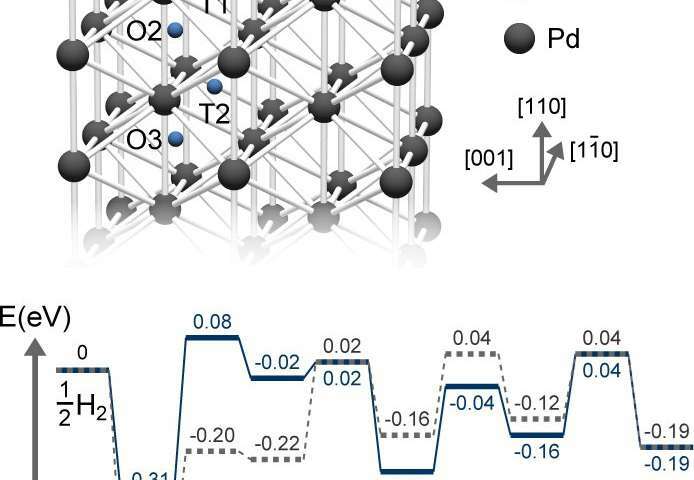 the hurdle that the H atoms must overcome to penetrate palladium. The barrier height is the gap between the energies of the chemisorbed H atoms and the transition state they must pass through to reach the first sub-surface site. According to density functional theory (DFT) calculations, the gold atoms destabilize chemisorbed hydrogen, thus increasing their energy and reducing the barrier. By making the surface a less stable environment for H atoms, this encourages them to penetrate more quickly into deeper sites, instead of lingering at the surface. Photoemission spectroscopy suggests that gold atoms push the energy of the palladium electrons downward, weakening their ability to chemisorb hydrogen. However, the weakly chemisorbed H atoms are also more likely to simply desorb from the surface; i.e., return to the gas phase. This unwanted process explains why hydrogen storage is maximized with just 0.4 monolayers of gold—if any more gold is added, the desorption of hydrogen outpaces its diffusion into palladium. "Our study reveals, at the electronic level, how gold alloying controls hydrogen absorption," co-author Shohei Ogura says. "This will help us to design better hydrogen storage materials, which will play a role in carbon-neutral energy transport, as well as solid catalysts for chemical reactions, which often depend on surface-bound hydrogen."